At the Paschal Divine Liturgy it is the custom that the priest not give his own sermon, but rather read the Paschal sermon of St. John Chrysostom, Patriarch of Constantinople (347-407 AD). St. John is the author of our Liturgy and probably the greatest preacher in the history of the Orthodox Church. The name “Chrysostom” is actually a nicknamemeaning “golden-mouth” in Greek. He has this nickname because of his skill as a preacher. Let us all read St. John’s sermon and take it to hear, or rather Christ’s invitation to partake of the Body and Blood of the Risen Christ, at the Paschal Divine Liturgy. And he shows mercy upon the last, and cares for the first; and to the one he gives, and upon the other he bestows gifts. And he both accepts the deeds, and welcomes the intention, and honors the acts and praises the offering. Wherefore, enter you all into the joy of your Lord; and receive your reward, both the first, and likewise the second. You rich and poor together, hold high festival. You sober and you heedless, honor the day. Rejoice today, both you who have fasted and you who have disregarded the fast. The table is fully-laden; feast ye all sumptuously. The calf is fatted; let no one go hungry away. overthrown. Christ is risen, and the demons are fallen. Christ is risen, and the angels rejoice. Christ is risen, and life reigns. Christ is risen, and not one dead remains in the grave. For Christ, being risen from the dead, is become the first fruits of those who have fallen asleep. To Him be glory and dominion unto ages of ages. Amen. Предвосхищая сие, Исаия воскликнул: «Ад огорчился, встретив Тебя в преисподних своих». Огорчился ад, ибо упразднен! Огорчился, ибо осмеян! Огорчился, ибо умерщвлен! Огорчился, ибо низложен! Огорчился, ибо связан! Взял тело, а прикоснулся Бога; принял землю, а нашел в нем небо; взял то, что видел, а подвергся тому, чего не ожидал! Смерть! где твое жало?! Ад! где твоя победа?! This entry was posted in Paschal Services, Sermons on April 11, 2015 by gldstrm. It’s easy to be a Christian and to love God when things are going well with us. On a warm, spring day we might spontaneously say ‘thank you’ to God for what He has done for us. As the English poet Robert Browning wrote: “God’s in His heaven, all’s right with the world”. Of course when things start to go wrong we instinctively turn to God in prayer. If we or a loved one gets sick, if we lose a job, if we have family or work problems, we ask God for help. This can comfort us for a while, but then sometimes it seems that God is not answering our prayers. Then we might become bitter, hate God or even lose faith in Him. In a sense we are like the crowds in Jerusalem during Jesus’ last week. On Palm Sunday Jesus enters Jerusalem in triumph. The crowds cry “Hosanna! Blessed is he who comes in the name of the Lord, even the King of Israel!” (Jn 12:13). They are ready for Jesus to drive the Romans out of Jerusalem and inaugurate the Messianic kingdom. Jesus Christ cleanses the Temple, the crowds expect some earthshaking event is going to happen. But then Jesus preaches and teaches as usual. He is not driving the Romans out and bringing in the kingdom. The crowds are disappointed and begin to turn against Him. Then Jesus is arrested, tried, beaten and mocked. The crowds know that this is not supposed to happen to the Messiah. When Pontius Pilate, the Roman governor or Palestine says to the crowd “Behold the man” (Jn 19:5). The crowds replied “…. Crucify him, crucify him!” Pilate said to them, “Take him yourselves and crucify him, for I find no crime in him.” The Jews answered him, “We have a law, and by that law he ought to die, because he has made himself the Son of God.” (Jn 19:6-7) The crowds have turned against Jesus because He did not do what they expected Him to do, what they thought He should do. At times we are like the crowds in Jerusalem. We love Jesus when things are going well with us, but when He seems to not answer our prayers we can turn against Him. But prayers are not magic and Christ does not promise us heaven on earth. He Himself was tortured, beaten and killed. That means Christ knows what it means to suffer, to (literally) bear the cross. As we accompany Christ through His last days during Holy Week, the scripture reading and the prayer tell us about His suffering. This means we are bearing our own crosses, as terrible as they are sometimes, and Jesus is with us, helping us to bear our cross. He promises us resurrection, of course, at the end of time, but through prayer to our Lord, our reading of scripture and veneration of icons, and above all in receiving Holy Communion, even in the midst of our suffering, we have a foretaste of the coming resurrection. By raising Lazarus from the dead before Thy passion,Thou didst confirm the universal resurrection, O Christ God.Like the children with the palms of victory,we cry out to Thee, O Vanquisher of Death: Hosanna in the highest! Blessed is He that comes in the Name of the Lord! When we were buried with Thee in baptism, O Christ God, we were made worthy of eternal life by Thy Resurrection. Now we praise Thee and sing: Hosanna in the highest! Blessed is He that comes in the Name of the Lord! Sitting on Thy throne in Heaven, carried on a foal on earth, O Christ God, accept the praise of angels and the songs of children, who sing: Blessed is He Who comes to recall Adam! This entry was posted in Church Services, Lent Services, Paschal Services, Sermons on April 5, 2015 by gldstrm. This entry was posted in Paschal Services on April 20, 2014 by gldstrm. 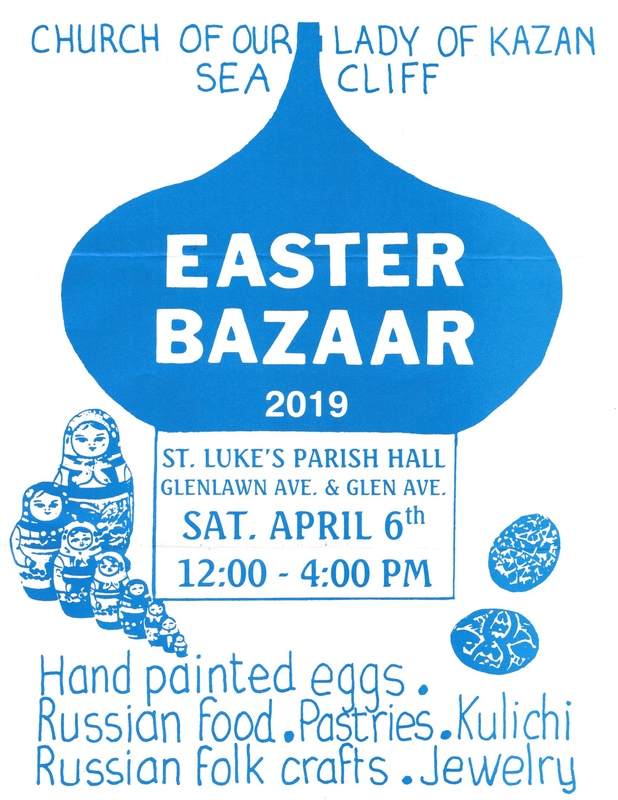 We are invited to join the Church of the Resurrection in Brookville (corner 25A and Rt.107) for the celebration of their parish feast on Saturday, April 26. Vespers begins at 7:00pm. We will not have Vigil in our church that evening. This entry was posted in Paschal Services on April 16, 2014 by gldstrm. 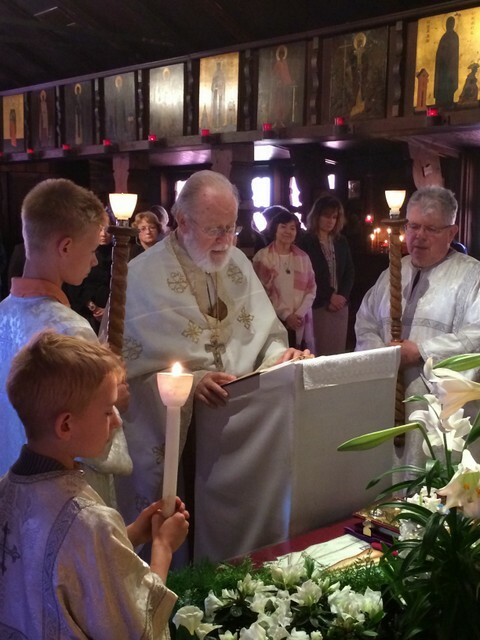 Divine Liturgy will begin at 10am and will conclude with a children’s procession around the church. After refreshments in the parish hall, there will be an egg hunt for children under 12 years of age. To help with refreshments for the adults, please share with us from your Paschal table. We would appreciate your donations to cover the costs of the children’s celebration (toys for the egg hunt and refreshments for the children). Please call 516-671-6616 to let us know how many children will attend.